Climate computer models, or global climate models (GCMs), attempt to quantify the interactions of atmosphere, oceans, land surface, ice and the sun to estimate the expected increases in global temperatures that result from increases in greenhouse gas (GHG) emissions. The models identify trends in climate conditions, especially temperature, over time, e.g., over 30, 50 or 100 years. GCMs divide the planet into grids, and apply to each grid various sets of data, like temperature, rainfall, amount of carbon dioxide, and sea levels, to show how each of these factors affects the others. Taken all together, the equations describe roughly how the climate works. Models do not tell us what the temperature will be on any day — that’s weather forecasting limited to a few days, maybe a few weeks. Nor do models tell us if any particular storm or extreme weather event was “caused” by global warming, but they can tell us to expect more intense and more extreme weather events over an extended period of time. While models are used to estimate future climate conditions, the irony is that they use past data to measure whether future estimates will be accurate. For instance, the model can focus on a particular past year, say 1970, and calculate the changes in the climate that would be expected in 30 years. Then the changes in the climate from 1970 to 2000 can be assessed to see if the model predicted correctly the changes that actually occurred. Compare modeling used to estimate climate conditions and weather forecasting. 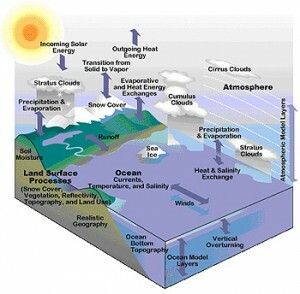 Compare computer modeling for climate to modeling used in other disciplines such as economics, hydrogeology, warfare. Are there any climate computer models that predict a falling global temperature over the next 100 years or a lowering of GHG emissions?